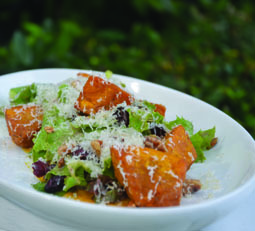 Combine the roasted pumpkin, lettuce leaves, cranberries, walnuts and seeds. Season with salt and pepper. Serve, followed by a drizzle of olive oil and sprinkle of parmesan.